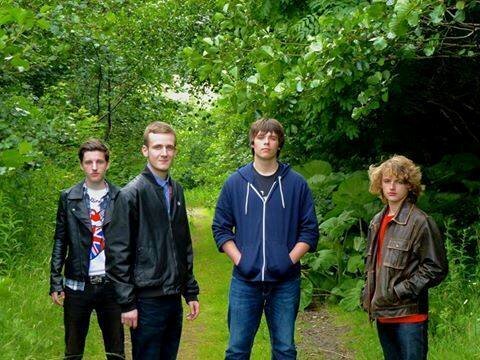 We head to Broxburn in Scotland for this latest Q & A to meet the teenage indie/punk band Indigo Sixteen, who are comprised of Stephen Mallin (vocals, guitar) Matt McPherson (guitar) Andrew Stears (bass, vocals) and Callum Davidson (drums, percussion). They’ve already featured here in Emerging #36 with their excellent debut Decide, while the follow up And What? comes out tomorrow (Sat Feb 28th)! Read on though, to find out what a crutch, some duct tape, and The Stig have to do with rock ‘n’ roll? ~ How did you all meet? We all met through Stephen and Andrew, who were looking to form a new band after a previous effort failed. At the same time Callum and Matt were looking to start a band of their own, asking Andrew (who knew them through a school wind band) for help in doing so. Instead Andrew asked them to join himself and Stephen, and after a first practice in April 2013 Indigo Sixteen was formed. ~ In Emerging artists #36 we described you as being both “ferocious and catchy”, but how would you describe your music? Our music can be described very differently compared to what songs you listen to, but there is always a feeling that the music is trying to push faster and faster. Take our two new singles as an example; ‘Decide’ is a loud, fast paced indie / punk tune, whereas ‘And What?’ has a slightly more dance-y kind of feel, but the rhythm still has a driving feel to it. ~ What’s the most fun part of being in a band? Making and playing new music. ~ You played the legendary King Tut’s in Glasgow last November. How did that come about, and what other legendary venue would you love to play next? We were contacted a number of months before by a promoter from Tuts wondering if we’d be interested in playing, however we had to turn it down as most shows there were 18+ and we have 2 members under 18. A few months later we were contacted again about a 14+ showcase being put on, and we couldn’t say yes fast enough! It was a dream that we’d had for a long time (what with its reputation and previous acts), and despite being first on it seemed to be near a sell out which really spurred us on to play the best set that we could. Realistically the next big venue would be something like Barrowlands or The Liquid Rooms, but if it could be anywhere, the Pyramid Stage at Glastonbury or Coachella. ~ If you could borrow a musician from another band for a day who would it be and why? Andrew – Between Johnny Marr or John Paul Jones. Fantastic writers and geniuses on their instruments. Callum – Definitely Matt Bellamy. Just to probe his mind for inspiration for a day would be amazing. Matt – Mark Tremonti. Amazing Guitarist. ~ Are there any other new West Lothian (or wider Scottish) bands that you recommend we check out? For Edinburgh based bands, there’s A Modern Masquerade, Car Crash Hearts, and Empire By Day, and at the other side of Scotland there’s Echo Valley. ~ What’s the most rock ‘n’ roll thing any of you have ever done? At an early gig there was no mic stand provided, so we had to improvise a mic stand from a crutch, a guitar stand, duct tape and some cable ties! We had to turn down our amps as it was too loud for our ears. ~ What are your plans for 2015? We hope to continue to make new music, perhaps some more recordings, and definitely play as much as we possibly can. The Stig, that way we’d get everywhere in the fastest time possible. ~ What’s your favourite takeaway?